As you graduate with your LLM in tax, you’ll find that your understanding of the intricacies of the tax code can make you an indispensable asset in a broad variety of enterprises. Though your area of study is hyper-focused, it is also necessary in an increasingly globalized business world. Experts foresaw continued demand in areas like tax law – mainstream “niche” practice areas – in 2017 and into 2018. 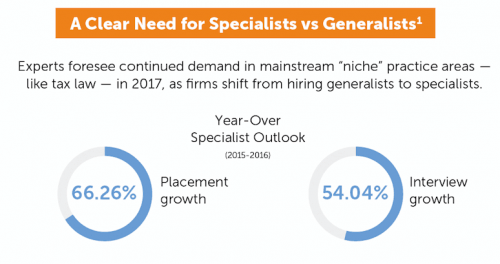 Firms are shifting from hiring generalists to specialists, setting the trend for many of the real-world opportunities for recently graduated tax law experts.